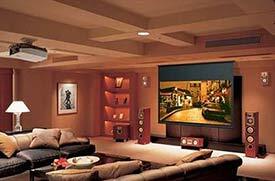 Add to your Home Theatre experience by expanding on your audio/visual products. Pivotal Communications Solutions performs professional custom installations of multiple types of flat screen TVs and standard TVs, surround sound, and ceiling mounted projectors with large hideaway screens all controlled by one simple to use device. Your audio/visual entertainment will never be the same once you indulge yourself in the ultimate Home Theatre experience!